Summer is when our children are home from school and while playing, are bound to get a scrape or cut. When it happens do you know the proper care? 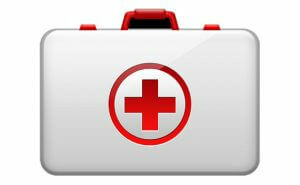 Do you have a first aid kit in your home? Here are some tips for a well-stocked first aid kit and how to handle those scrapes and cuts. Most minor injuries are treatable at home, if done properly, to prevent infection. A well-stocked first aid kit is a must-have in every home even those homes without children. Consider an extra for your auto too. You can make your own first aid kit or you can purchase one at most retailers. Here are the necessities for a well-stocked home first aid kit. Store your first aid kit out of reach of children and in a centralized area of your home, such as your kitchen or bathroom. Check your first aid kit after each use or once per year to be sure your items have not expired or you have not run out. Follow these steps by Web MD to keep cuts clean and prevent infections and scars.